The Soprano is the smallest of the ukuleles, measuring from 18" to 24" in length, depending on the manufacturer. I think a true soprano size is no more than 23", but that's just my opinion and does not reflect the quality of any particular model the maker calls a soprano that is a few inches longer than that. 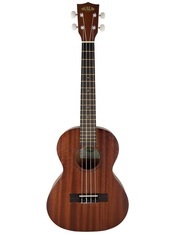 This little guy is the one that most people imagine when the word "Ukulele" comes to mind. If poorly made, they have a shallow "plinking" sound. Unfortunately, some of us in the older generation have associated it with a certain individual from our past named Tiny Tim and even before that, picture a group of fun guys from the roaring twenties in racoon coats. Those images did a lot of harm to the credibility of the ukulele as a serious instrument for awhile. Thankfully, time heals, and good professional musicians have reinstated the uke to it's proper place in music. The soprano, like the tenor and concert is tuned G, C, E, A. For getting the best sound out of a soprano, look for solid mahogany or koa woods. You can get a good laminated, if it's multilayered, and well made throughout, with geared tuners (Grovers are the best) and Aquila strings. (If the tuner pegs are not geared, you will find the strings slip out of tune frequently, even after the break in "stretching" period). There are several affordable soprano ukulele brands I can recommend to you that have a history of customer satisfaction for craftmanship, quality sound and appearance. While I am partial to the Oscar Schmidt brand of stringed instruments, I think Kala KA-15S and Luna Honu style (not the best tuning pegs, but no one seems to have complaints about them) have the better bargains in this size. You would have to jump up several hundred dollars to get anything substantially better. Look at the Concert and Tenor sizes for more variety.